AE Component of the Month - July - Scarabs by Me! 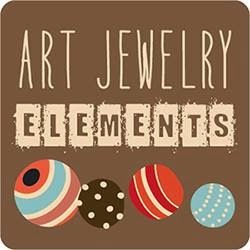 I provided the scarab beads for the Component of the Month Challenge over at Art Elements for July! And as usual, didn't take a photo of my own bead before I started working with it. But here is the one I used - unfortunately, you can't see the lustrous oil slick colors of this black metallic glass because once again we have cloudy days here in Pittsburgh. I made a choker length necklace using spiral stitch and these awesome seed beads that go so well with this black metallic glass! I used hematite swarovski crystals to divide the bead stitching and the scarab focal bead; I actually ordered a pile of pairs of various black swarovski colors and decided that these match the best! I finished off the necklace with the ball socket clasp - it's a nice way to finish a spiral stitch - the size is just right and it's fairly easy to sew into the design. Please check out what our guests and team members made with their scarabs! And thanks to everyone who took part in designing with my scarabs! I just love your spiral stitch rope for your scarab! I have been wanting to try that for a necklace for a long time. After seeing yours I am inspired to go for it. The beads you chose are perfect-I LOVE this oil-slick finish on the scarab! All your scarabs are beautiful but this color is my fave!! Thanks for hosting this month and thanks for the bead!! Love your beadwork Sue, it's perfect and that clasp is a beautiful finish! Thanks so much for sharing your wonderful scarabs. I've had fun working with mine! What I would make if I had skills and wasn't lazy...lol. Seriously, we could add this to my bracelet so it will wrap around my wrist a few more times. All you seed beaders made me jealous. Oh my...how stunning. I love the choice of colors. And I do enjoy the spiral stitch. Great job! Your scarab beads are so wonderful, thanks for hosting a great challenge this month! Your spiral rope is stunning and really highlights the bead perfectly. Gorgeous necklace! Thanks for hosting this challenge! I had fun working on my funky collar! I love your piece Sue, and thank you so much for sharing your work with us this month. I had so much fun working with the scarab and the donut together. Guess what's next on the bead tray! You always do such a nice spiral rope. its a great stitch and goes so well in this design. Colors complement and stitches add textures - all lovely. Thanks for these Sue they are a treat to work with! I really love your bead work it is always beautiful and these scarabs are just amazing! Thank you so much Sue! LOVE the new bead Sue :) and the perfect piece to show it off!